Photographers looking to buy a compact camera have very different requirements than casual family snappers. Image quality is of course paramount, but manual controls, a razor-sharp lens and robust build quallity are likely to be top of the list. Naturally, this all comes at a price. As with the P300, the P310's 4.2x optical zoom offers the 35mm equivalent of a 24-100mm lens. A modest zoom range compared to the P510's ridiculously powerful 42x zoom, perhaps, but it's well suited to both landscape and portrait photography. It boasts a fast f/1.8 aperture at the wide end too, which is useful for taking pictures in low light. In addition to that bright f/1.8 lens, the P310 features a mix of features that could give it the edge in low light. Chief of these is its 16-megapixel CMOS sensor which is back-illuminated. This means that each pixel gathers more light than a traditional front-illuminated sensor. Shooting long exposures on a camera with a small but high-res sensor is usually a recipe for noisy pictures. To combat this, the P310 features a Night Landscape mode. This combines a series of shots taken at shorter exposures into one image with reduced noise. Advanced Night Portrait mode does a similar thing, but also adds a flash exposure for the subject. There's also an Auto HDR mode for tricky backlit situations. Nikon has incorporated its second-generation of lens-based Vibration Reduction (VR) in the P310, enabling you to hold the camera steady at a shutter speed which is four times slower that normal. The mode dial features the traditional selection of Aperture Priority, Shutter Priority, Program and full Manual shooting modes. There's also a User mode setting, which you can use to recall a previously configured group of camera settings. In good light, Nikon's image processing architecture enables a high-speed continuous shooting speed of 6 frames a second, for up for five full-res shots. 1080p is becoming the standard format for high-end compacts, and the P310 offers Full HD at 30fps with stereo sound. It's also capable of filming in slow or fast motion at speeds of up to 120fps. This still doesn't quite match the Canon S100, which supports 24fps normal speed and 240fps high speed shooting. You can create 3D stills in MPO format, with the camera combining two separate shots to create the final image. These need to be taken from different positions, but the P310 automatically takes the second shot when it detects you're in the right place. Some of the differences between the P300 and the P310 are very subtle. Perhaps the most obvious change is the addition of a 'Function' button on the front of the camera. This is customisable, allowing you to assign a frequently used camera setting to it rather than having to dig through the camera menus. Like its predecessor, the P310 doesn't support NEF files. The fact that images can still only be recorded as JPEGs might prove a sticking point for serious photographers. 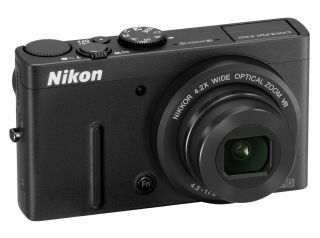 The Nikon P310 UK price will be £299.99 and it will be available from March 2012.